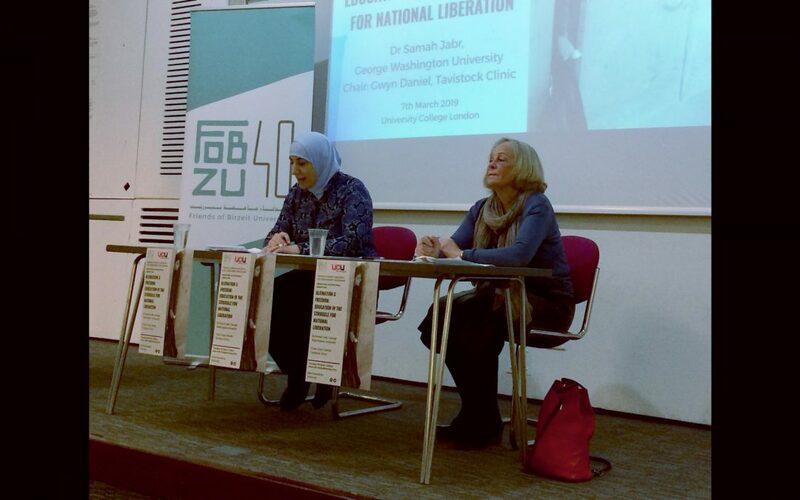 Samah Jabr, leading Palestinian psychiatrist, writer, and Chair of the Palestinian Mental Health Unit, opened the first event of 2019 in the Education, Occupation & Liberation series with a lecture on the colonial predicament facing the Palestinian people. The event was chaired by Gwyn Daniel, senior psychotherapist at the Tavistock Clinic. The lecture, entitled ‘Alienation and Freedom: Education in the Struggle for National Liberation’, presented an examination of multiple dimensions of Palestinian alienation, contextualised within the political structure of colonialism, as experienced by Palestinians under occupation and in exile. In her presentation Dr Jabr illustrated how individual and collective aspects of alienation are fostered and resisted in the arena of education. In one example, Dr Jabr examined the situation of Palestinian schools in occupied East Jerusalem. Despite overcrowding and underfunding compared to Israeli schools in Jerusalem, for the past five decades most Palestinian schools have successfully resisted attempts by Israel to change the taught curriculum. However, pressure on Palestinian schools to adopt the Israeli national curriculum has recently increased, with a minority of schools accepting the changes. The exclusion of Palestinian history and legitimisation of the occupation this entails reproduces the ideology of the occupation. The result, Dr Jabr argued, is the estrangement of Palestinian students from their schools and teachers, and a broader disaffection with education in general. Dr Samah Jabr’s talk took place on 7th March at UCL. The video of the talk is available here.